I hope you enjoyed your New Year celebrations. May this New Year bring with it only the best for you and your family and may you receive the blessings that only G-d can bestow. As I look forward to this new year, I am excited about some of the new projects and ideas that we have begun. We are reaching out to new audiences each day, as we are preparing to launch new initiatives in social media. I am currently preparing for my ninth trip to Australia and as I look back on that first trip, when it was all so new to me, I am overcome with gratitude for the growth we have experienced since. Each trip brings me to new audiences and our family of Australian supporters has grown significantly. During last year’s visit, I opened a bank account in Australia and our Australian donors are now able to donate to CFOIC Heartland with a simple local banking procedure. For years, Joy Heylen has tirelessly worked to promote CFOIC Heartland in Australia and has been responsible for most of the meetings and new audiences that we have been introduced to over the years. 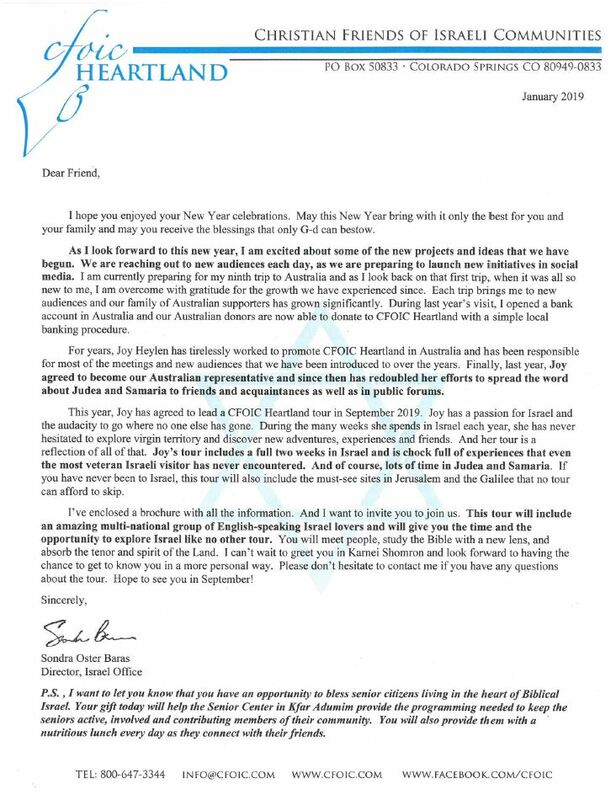 Finally, last year, Joy agreed to become our Australian representative and since then has redoubled her efforts to spread the word about Judea and Samaria to friends and acquaintances as well as in public forums. This year, Joy has agreed to lead a CFOIC Heartland tour in September 2019. Joy has a passion for Israel and the audacity to go where no one else has gone. During the many weeks she spends in Israel each year, she has never hesitated to explore virgin territory and discover new adventures, experiences and friends. And her tour is a reflection of all of that. Joy’s tour includes a full two weeks in Israel and is chock full of experiences that even the most veteran Israeli visitor has never encountered. And of course, lots of time in Judea and Samaria. If you have never been to Israel, this tour will also include the must-see sites in Jerusalem and the Galilee that no tour can afford to skip. I’ve enclosed a brochure with all the information. And I want to invite you to join us. This tour will include an amazing multi-national group of English-speaking Israel lovers and will give you the time and the opportunity to explore Israel like no other tour. You will meet people, study the Bible with a new lens, and absorb the tenor and spirit of the Land. I can’t wait to greet you in Karnei Shomron and look forward to having the chance to get to know you in a more personal way. Please don’t hesitate to contact me if you have any questions about the tour. Hope to see you in September! P.S. , I want to let you know that you have an opportunity to bless senior citizens living in the heart of Biblical Israel. Your gift today will help the Senior Center in Kfar Adumim provide the programming needed to keep the seniors active, involved and contributing members of their community. You will also provide them with a nutritious lunch every day as they connect with their friends.